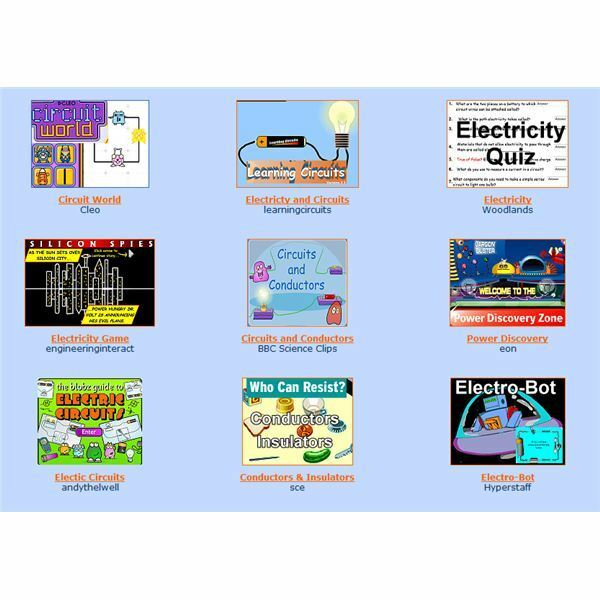 Four Kids’ Websites About Electricity for Practice and Fun! websites. The following four websites include explanations of the scientific processes involved, pictures, videos, games and quizzes. They make the science of electricity interesting and simple to understand, and best of all, they make learning about electricity fun! Teachers can use the sites' graphic models of electrical processes as posters or bulletin boards in their classrooms, and the games and hands-on experiments make non-traditional homework assignments that kids will actually enjoy doing. Teachers can also choose to use the experiments as in-class demonstrations, and students can use them as inspiration for science fair projects. With so much to learn about all the ways electricity influences our lives, computer games and simple, safe experiments help kids retain all the electricity facts they study in school. Science Made Simple is a thorough and easy to understand kids' website. Electricity appears in several different forms, one of which is static electricity. This is what causes the zap when someone touches something metal after walking in the wind. Static Electricity at Science Made Simple begins with an explanation of atoms and the pieces of an atom, then talks about their electrical charges and gives a clear description of static electricity. The website describes the nature of atoms using metaphors and examples geared for late elementary school students, then has a special section labeled "I Can Read" for younger elementary-schoolers. It also offers a somewhat more advanced section on Coulomb's Law for older students, which explains the physics of electrical field strengths and illustrates Coulomb's formula with diagrams. The page features four experiments kids can do at home to explore static electricity, using common household objects like cereal, a comb and a balloon. The first of these experiments shows kids how to move electrons from one object to another, demonstrating how electric charges can be changed. 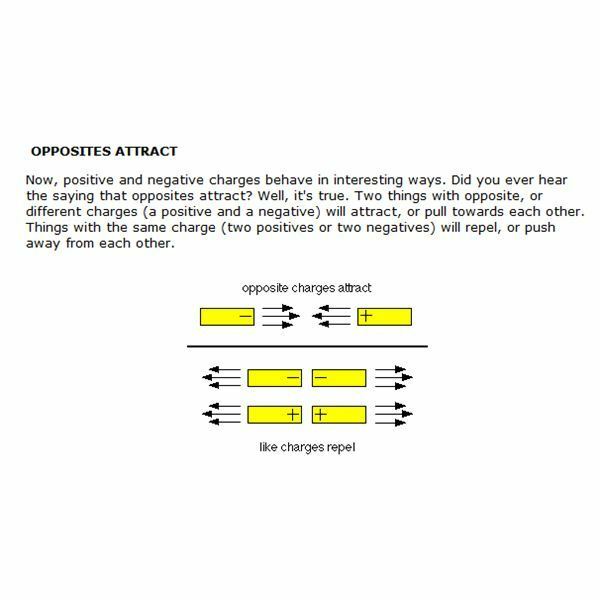 This also helps show how electricity relates to magnetism, which elementary-schoolers study in the same unit in class. Another experiment is a variation on the old favorite of using static electricity to stick balloons to the wall. This experiment helps kids see why static electricity is more of a problem in the winter than in the summer. Hands-on experiments are not only a great learning tool, they're also fun! This website is a great teaching tool with plenty to offering kids from fourth grade through ninth grade. The website, Mandy Barrow's Science Zone has links to a series of electricity websites. It begins with a very brief description of an electrical circuit, and then offers 15 links to games, videos and activities about electricity and circuits, all chosen just for kids. The site includes four lessons on man-made electricity, with quizzes for kids to test themselves. The first lesson focuses on the differences between natural electricity, the electricity we get from power outlets, and batteries, and asks kids to sort household appliances based on which electrical sources power them. The second lesson deals with circuits, conductors and switches, and gives kids clear illustrations of what makes a complete circuit. The third lesson is a slightly more advanced lesson about the way engineers draw circuits in their designs. The fourth lesson allows kids to test what happens when an extra light bulb or battery is added to a circuit. These lessons were written for kids in third or fourth grade, and they give kids lots of opportunities to play with circuits and switches to see how they work. The website focuses on people's usage of electricity rather than naturally occuring electricity, so it will be more useful for students who are learning about batteries and currents than for kids who are studying protons and electrons. One should note that the website was designed for Woodlands Junior School in Kent, England. It uses the British word "mains," which means power that comes from an electrical outlet. Nevertheless, the entire site is interactive, which makes it easier for kids to remember what they learn. PBS.org has a full section about Benjamin Franklin, including pages about his writing, his political career, his personality and his inventions. It includes a page about electricity called "How Shocking," and it has an interactive flash video about the experiments he did. It talks about the way Franklin discovered that lightening is a kind of electricity and that it behaved in predictable ways. Kids can see an interactive demonstration of Franklin's experiments with static electricity, which he did with a piece of silk fabric and a glass rod, and then learn about the static electricity generator that he used. 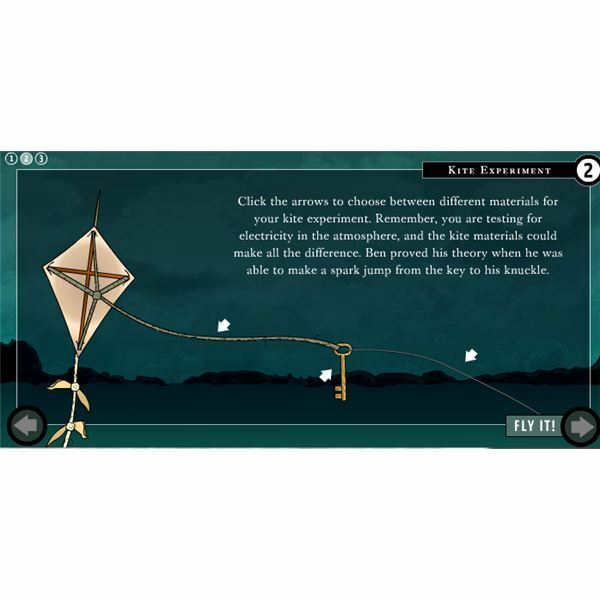 Kids can then recreate Ben Franklin's famous kite experiment, trying different virtual materials, weather and timing until they find combinations that will trigger electrical activity. The demo lets students choose between a wet kite string and a dry kite string, a metal key and a wooden key, and a metal wire and a silk ribbon, showing kids which materials make good conductors and which do not. Finally, the demo lets kids test different materials and placements for lightening rods to protect a virtual house, teaching them about grounding currents safely. This kids' website about electricity makes science fun, and teaches a little history in the process. Kids may enjoy visiting the other pages about Franklin, too, and reading about his creativity and sense of humor. While the site is designed for students in fourth through sixth grade, older students can also benefit from the playful and clever demos. Another fun website is the The Tech's page on electricity. It walks kids through the nature of electricity and how it's used. It shows how circuits are made and how to use them safely, then finishes with a design game that lets users create their own electrical invention online. Students get to be creative while applying the knowledge they have just gathered. It also includes links to other areas of The Tech's site that could help kids learn about circuits, gears and inventions. This site is somewhat more in-depth, making it better suited to middle school and high school kids than elementary-schoolers. It doesn't stop with the basics — instead, it talks about the differences between heat energy, light energy and motion energy, gives kids instructions for an electricity scavenger hunt in their own homes, and gets them thinking about the different ways the items they find use electrical energy. The site includes lessons on the differences between simple, series and parallel circuits, and then, rather than having demos for kids to construct virtual circuits the site, it teaches kids how to make actual circuits in their homes. It also includes lessons on conductors and insulators and guides kids through some experiments they can do to explore these topics using the circuits they have already built. There are links to other sites that teach about electrical safety, and the Tech gives kids a checklist they can use to inspect their homes for electrical dangers. The site is interactive and descriptive, making it a useful and fun kids' website about electricity. Kids can use these websites to learn about the nature of electricity, the history of humanity's use of it and the different ways it appears in the world. 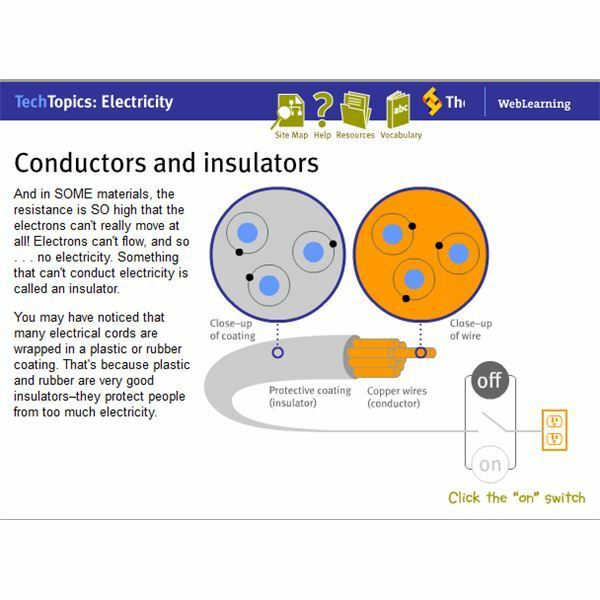 Each of these kids' websites about electricity is easy to understand and has interactive games or experiments that help explain about circuits, static electricity or conduction. Pictures and models make learning easy, and games and puzzles make learning fun! These websites just for kids will keep students interested and show them what there is to love about science.